I am not much of a purple fan, honestly, but this color surprised me. 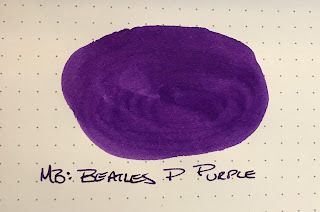 I received a sample from one of my friends in our local pen group and I am quite taken by this color. 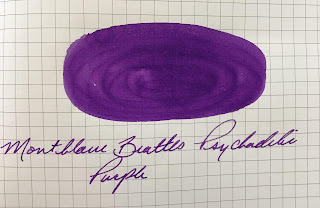 I even went through all of my purple ink swabs and cannot find much close to it, from what I have available. Let's look at it. This is the latest Special Edition ink from Montblanc and I really enjoy the special bottle that this ink comes packaged in. It is a 50mL bottle and is listed at a whopping $43 here in the U.S. 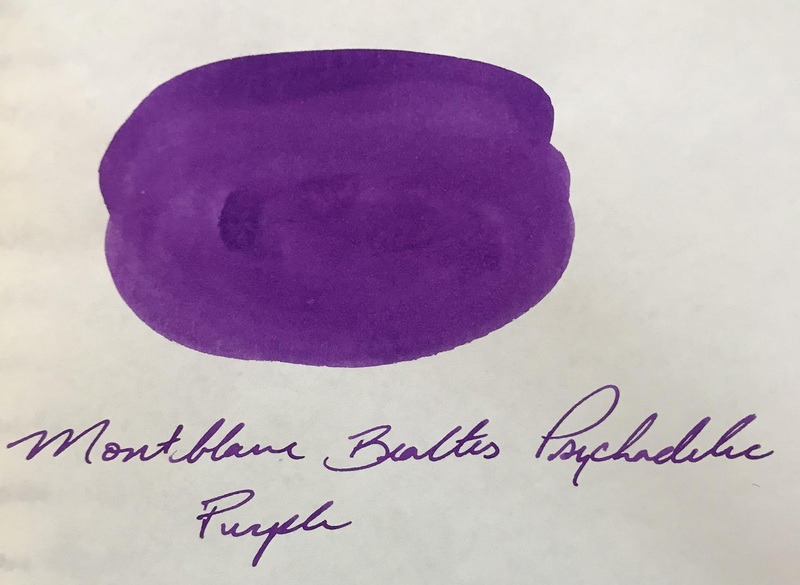 This is a very vibrant color and yes, I know I have misspelled the work psychedelic here in these swatches. We all make errors from time to time. There is some sheen seen on some paper but it needs to be applied liberally for it to show. 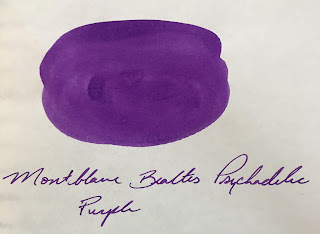 The ink itself is very well behaved and had no feathering, bleed or spread. It has nice flow and some decent shading when shown as it is a bit darker. What I really enjoy is the way the ink remains constant no matter the paper being used. The ink color is vibrant and actually is fun to write with. 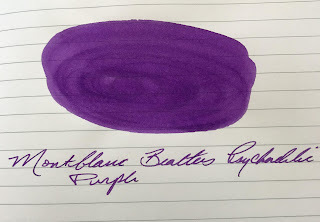 It reminds me of the infamous Noodler's Baystate Blue with how vibrant it can be. 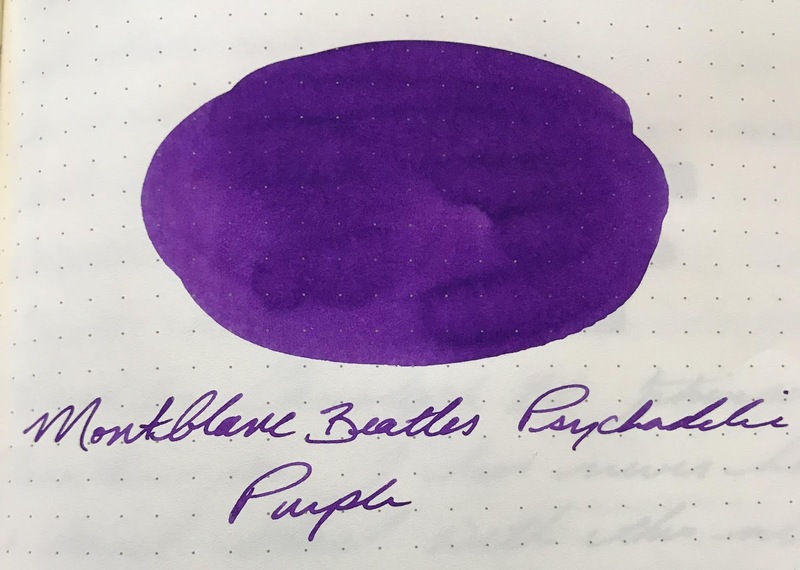 I believe I need to purchase a bottle of this ink. This color has turned me into a purple lover, at least this particular purple. 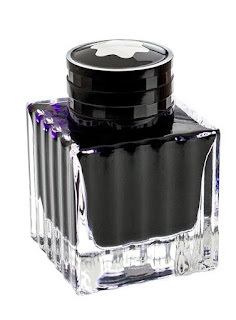 It is an expensive offering but 50mL is a good quantity and I do not have anything close to this shade of color. This review is based off of my opinion and experiences. I do not represent Montblanc at all nor am I being compensated in any way. Oh nice purple! And I love the MontBlanc inks. 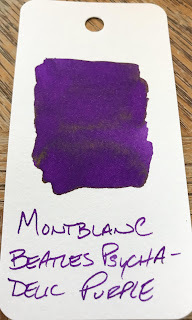 I have not used a MontBlanc ink yet that has not been well behaved.